John Thomas Salley (born May 16, 1964) is an American retired professional basketball player, actor and talk show host. He was the first player in NBA history to play on three different championship-winning franchises, as well as the first player (and only one of two, the other being Tim Duncan) in the NBA to win a championship in three different decades. After being drafted in the first round out of Georgia Tech in 1986, the 6'11 (2.11 m) Salley played both power forward and center for the Detroit Pistons, Miami Heat, Toronto Raptors, Chicago Bulls, Panathinaikos and Los Angeles Lakers. He was a long-time host of the former Fox Sports Net show The Best Damn Sports Show Period. Salley was born in Brooklyn, New York. Salley played high school ball at Canarsie High School in Brooklyn. He is a 1988 graduate of Georgia Tech's College of Management. He holds Georgia Tech's blocked shot record, and has had his jersey number 22 retired—a very rare honor in college basketball. Salley was drafted by the Detroit Pistons in the first round of the 1986 NBA draft out of Georgia Tech. After joining the Pistons, he became close friends with Adrian Dantley, who taught him proper nutrition, how to exercise, and how to conduct himself off the court. Salley, for his part, called Dantley "The Teacher". Salley would become good friends with comedian Eddie Murphy and made several appearances at comedy clubs in the off-season. In 1989 and 1990, he played on two Pistons NBA championship teams. He is among the Pistons' all-time leaders in blocked shots. Under the coaching of Chuck Daly, Salley was part of the Pistons era that featured three consecutive NBA finals appearances. The team's defense oriented style of play earned them the nickname of the NBA's "Bad Boys", with Salley playing alongside Dennis Rodman, Bill Laimbeer, James Edwards, Joe Dumars, Isiah Thomas, Rick Mahorn and Dantley. After losing the 1988 NBA Finals in 7 games to the Lakers, the Pistons turned it around to sweep the Lakers in 4 games in 1989. Salley and the Pistons repeated in 1990 defeating the Portland Trail Blazers in 5 games. The Pistons' run came to an end when the Michael Jordan-led Chicago Bulls swept them in 4 games in the 1991 Eastern Conference finals. Salley was traded to the Miami Heat in 1992 and, a few years after that, was left unprotected by Miami in the 1995 expansion draft. Following a short stint with the inaugural Toronto Raptors team where he received little playing time, he negotiated a buyout of his contract. Free of his Raptors contract, Salley signed with the Chicago Bulls, where he played with Michael Jordan, Scottie Pippen, Toni Kukoč, and former Pistons teammates Dennis Rodman and James Edwards. The Bulls of 1995-96 achieved a record-breaking 72-win season, ending with victory in the NBA championship. After the championship, Salley retired. In 1996, Salley came out of retirement, and went to play in Greece, where he joined the Greek Basket League team Panathinaikos, for 7 games, and earning about €300,000 euros net income. In 1999, Salley joined a Lakers team led by Shaquille O'Neal and Kobe Bryant. He saw little action for the Lakers en route to their first of three consecutive NBA championships from 2000 to 2002. In 2000 he retired again following the first Lakers championship season after proudly proclaiming that he had won "four championship rings, with three different teams, in three different decades and two different millenniums". John Salley had a role in Bad Boys and Bad Boys II, as a thick-glassed computer hacking nerd who gets out of jail because he helps cracking files for the Miami Police Department. In 1996, Salley appeared as a veteran basketball player alongside Whoopi Goldberg in the film Eddie, about a fan who takes over as coach of the New York Knicks. In the fall of 1998, Salley hosted the game show I Can't Believe You Said That, which aired on the Fox Family Channel. During that time, he also guest-starred as a panelist on Hollywood Squares. In 2001 he made an appearance in the Luther Vandross music video, "Take You Out". In 2003, Salley appeared in the Showtime TV film Coast to Coast alongside actress Selma Blair. In 2004 he was part of the panel of celebrity judges in the TBS Superstation show He's a Lady. In 2005 he appeared in the television series Noah's Arc as Victor. In 2006, Salley was named the Commissioner of the American Basketball Association. In 2007, Salley appeared in the ABC reality television series Fast Cars and Superstars: The Gillette Young Guns Celebrity Race, featuring a dozen celebrities in a stock car racing competition. In the first round of competition, Salley matched up against professional wrestler John Cena and tennis star Serena Williams. Salley also became the host of the BET show Ballers. Salley joined the cast of the reality competition show I'm a Celebrity…Get Me out of Here!, which premiered on June 1, 2009. He came in third place with Lou Diamond Phillips winner and Torrie Wilson runner-up. On the show he became friends with Patti Blagojevich who is the wife of Rod Blagojevich. He also appeared in the movie Confessions of a Shopaholic in 2009 as a member of the shopaholic help group (interestingly playing a retired NBA player), and had a bit role as a pimp in the blaxploitation spoof Black Dynamite. Known for making racially disparaging comments while hosting The Best Damn Sports Show Period on Fox Sports Network. For a short time, Salley provided analysis for NBC's NBA Showtime. Salley appeared in the Disney Channel original movie, The Ultimate Christmas Present as a tall elf. Salley hosted a podcast on Adam Carolla's ACE Broadcasting Network with sportswriter Kevin Hench entitled Spider and the Henchman. The show was canceled on March 18, 2011. Salley has also hosted VH1's Basketball Wives (2010-2012) & Basketball Wives LA (2011, 2012, 2014, 2015) Reunion Specials. In 2012, he appeared as a celebrity judge on RuPaul's Drag Race (season 4, episode 2). On an episode of Bravo's Millionaire Matchmaker ("The NFL Kicker and the Workaholic", aired March 12, 2013), he acted as a consultant to Patti Stanger, to help one of her clients (an ex-NFL player) become less of a "playa" and find a woman to settle down with. He is also ambassador for Operation Smile. Salley is a vegan and has appeared on PETA's testimonial videos, as well as in promoting alternatives to practices of massive factory farming. Salley is also noted for speaking at Michigan's Vegfest since 2009 and appearing on VegMichigan's billboard campaign. On May 4, 2010, it was announced that Salley had joined the Simply Raw team. The group of individuals who produced the documentary Raw for 30 had approached Salley with their video about reversing diabetes, and "it instantly got his attention" since his father had the disease. Salley teamed up with Farm Sanctuary in 2010 to host their New York City Walk for Farm Animals on Sunday, October 24, 2010. Salley married Natasha Duff in 1993, and they have 2 children together. John also has a daughter from a previous relationship. John Salley is a member of Omega Psi Phiiniatated through Nu Omega Chapter in Detroit Michigan. In June 2012 Salley became the official spokesperson for a natural supplements line called VirMax that is developed by Natural Product Solutions, LLC. In December 2015, Salley encouraged US First Lady Michelle Obama to go vegan "for the planet" - setting a lifestyle example of reducing environmental impacts from greenhouse gas release. "Vegan eating is not just a slam dunk for human health; it’s also the most effective way to combat climate change." ↑ Anderson, Dave. " Sports of The Times; City Teen-Agers Hold A Calm Garden Party", The New York Times, March 19, 1995. Accessed October 10, 2007. ↑ Leigh Montville. "Holy Cow, What Digs!". Sports Illustrated. November 6, 1989. Retrieved on January 9, 2010. ↑ The retiring of players' jerseys is not uncommon in college basketball, but retirement of numbers is far more rare. The main reason is that far fewer numbers are available for use by college teams than in the NBA. NCAA rules, unlike those of the NBA, prohibit the use of any digits greater than five in player numbers. Georgia Tech has not only retired Salley's number 22, but also the number 25 worn by Salley's teammate Mark Price, the number 15 worn by current NBA player Matt Harpring, the number 20 worn by former NBA player Tom Hammonds, and the numbers 21 and 40 worn by Roger Kaiser and Rich Yunkus, respectively. ↑ Ο μήνας της "αράχνης" (Greek). ↑ "John Salley Trivia & Quotes". TV.com. 1993-07-31. Retrieved 2011-12-16. ↑ "I'm a Celebrity Cast Announced; Blagojevich Inexplicably Still Involved". TVGuide.com. Retrieved 2009-04-24. ↑ "Film Review: Black Dynamite". Archived from the original on January 10, 2010. Retrieved 2010-03-08. ↑ Spider and the Henchman Archived January 14, 2010, at the Wayback Machine. ↑ "Sneak Peek Basketball Wives L.A Finale Reunion Airs Right After!". vh1insider.com. Retrieved 2012-12-06. ↑ "I am an athlete and I am a vegan", Featured Veggie Testimonial, PETA, Accessed July 4, 2008. ↑ "John Salley on Animals as Food". YouTube. 2010-11-20. Retrieved 2011-12-16. ↑ "New York City Teams Up with NBA Champion John Salley for the 2010 Walk for Farm Animals". Farmsanctuary.org. 2010-10-08. Retrieved 2011-12-16. ↑ "WEDDINGS; Natasha Ann Duff, John Salley". The New York Times. August 1, 1993. 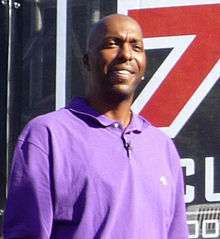 Wikimedia Commons has media related to John Salley.